We got back from our camping trip on Wednesday and I feel like I haven't slowed down since. We had a great time at the coast. Perfect weather, not too hot, not too cold and it didn't rain. Always a possibility here in Oregon. Here are a few pictures of our trip. My son and his buddy roasting marshmallows. My cute daughter and her buddy. The kids each brought a friend along and they both had their own tents, so my honey and I got to have the big tent all to ourselves. I decided to set up the air mattress with sheets and a comforter instead of sleeping in my usual sweaty sleeping bag and it worked out great. Pretty too. Hubby took the kids crabbing on Tuesday morning so I headed out to check out some thrift stores and antique shops nearby. Pickins were slim, but I did manage to find a few items worth buying. 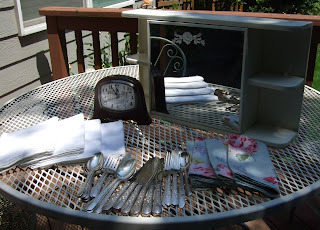 Two sets of vintage white pillowcases, a bag of silverplated silverware, vintage deco clock, ralph lauren roses napkins and cute medicine cabinet with etched rose and shelves. To back track a little, I hit a couple garage sales last Saturday and found some neat things. 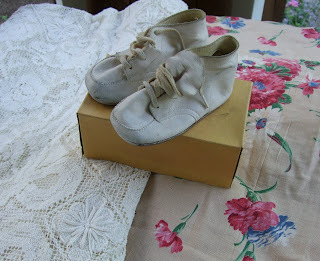 Vintage barkcloth era coverlet, lace tablecloth and baby shoes at one sale. 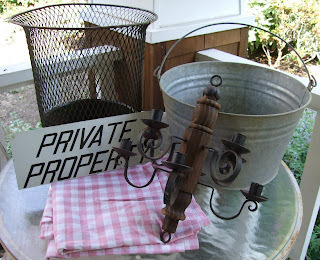 Metal waste basket, metal bucket, old sign, old candle chandelier and pink & white check fabric at another sale. And finally, I wanted to show you the end result of the little display cabinet I pictured on my last post. I think the makeover went very well. This little cutie is head to Expo next weekend. Early this morning Isabel and I headed over to Silverton to help Joy set up for the Old Stuff 4th of July sale. We saw lots of our favorite people and I will show you pictures on my next post. Heading out tonight for a big fireworks display. I hope you are all having a fun and safe 4th of July! P.S. If you haven't already, stop by Isabel's blog for some awesome pics of her recent vacation to Portugal and London. Hi Lisa! Sorry for not visiting in awhile.... looks like you had lots of fun camping and I LOVE your idea about the comforter and pretty bedding for you tent....lol. so cute! Lisa, I love how that little cabinet turned out..!! I'm sure that will go fast at Expo!! Thank you for the plug to my blog, you have the coolest blogging friends and I would be thrilled to have them visit me!! Love you! Hey you! i'm glad i finally got to meet you! You have some super cute stuff on here, i hope to see you soon ! Lisa ~ ohhh that looks like so much fun ! 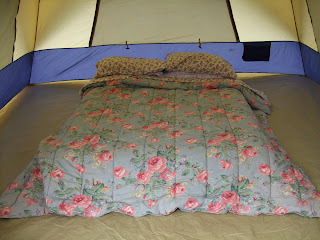 I haven't been camping in years and years ~ You gotta love a rose bedspread on a bed in a tent ! That is my kind of tenting it ! What great finds! I love the cart liners too. I haven't been able to visit your blog in awhile and boy have I missed out! Before I head back in to get lost in all the goodies, I just HAD to say "OMG you shabby chic'd the tent!!!" I love it!!! Absolutely love it! THAT is how to live....take a lil bit of you everywhere you go! I love the tent...looks so cozy! What great finds at your garage sales! I love the way you camp! Your bed is so cute too!! It looks like you had a great time! I love the pretty bed and it's so clean inside your tent. As a fellow tent camper I know that it's not always easy keeping it clean. It looks like you did pretty good while out thrifting! 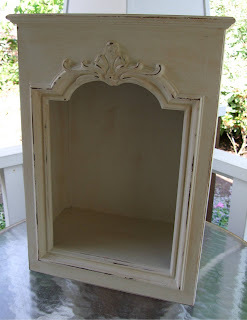 The cabinet is darling! You are so talented.